This mountain bike route of 20.6 miles starts from Bakewell in the White Peak. The rolling limestone hills of this area give some good riding, which is combined with great scenery. Although the elevation is never that high there are some fun descents and testing climbs. 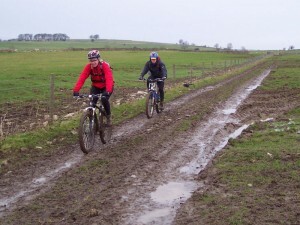 While this route can get quite muddy it is always rideable. 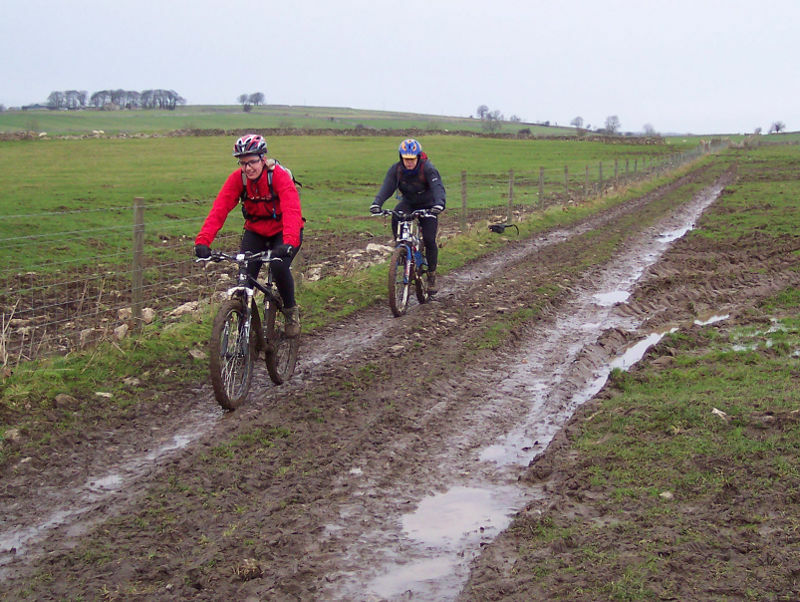 However, you will need to watch out for wet roots and limestone, they’re very slippery. 1. Start from the car park by the stone bridge across the river Wye in Bakewell (GR220686). Turn right out of the exit of the car park then go past the entrance road to the car park on the right, directly after. A short distance later turn right down the short tarmac footpath between the houses. Dismount and push to where it finishes at the car park at the back of the Agricultural Centre (GR221685). Turn left and follow the road clockwise to bear right around the Agricultural Centre. At the junction with the main entrance road turn left and follow it away from Bakewell. The road soon bears right to go over a bridge before ending at a junction with the A6. Turn left onto the A6 then a short distance later at the end of the houses, turn right on a tarmac track signed as a dead end (GR223676). 2. Climb through a couple of bends and past a lead jacket on the right. After leaving the houses behind follow the double track through a few more bends to a gate at the bottom left hand corner of a field. Go through the gate and climb straight ahead, up the left hand side of the field, to a small gate in the corner at the top (GR215667). Go through the gate then turn left on the lane. Go straight on at the crossroad at the farm then go through a dip in the road. Climb out of the dip to a junction at the top where the lane bears right, with a track that goes straight on to a gate (GR216662). 3. 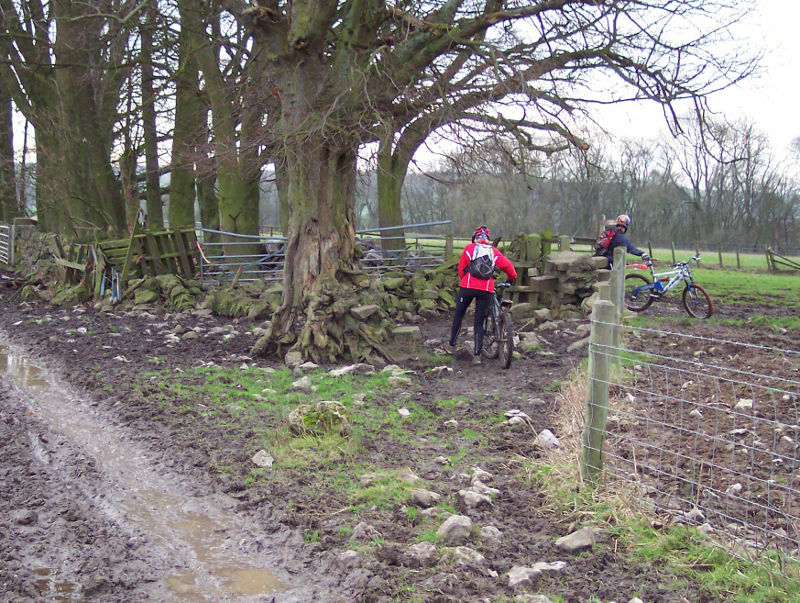 Go straight on through the gate and descend gently along the muddy double track, keeping by the wall on the right. After another gate and continue straight on through another field and head towards the next gate at the farm buildings. Just before reaching the farm buildings turn right through a gate in the drystone wall beneath the big old trees (GR217653). 4. After the gate bear slightly left across the bumpy field to a small gate at the end of the fence on the left, where the drystone wall begins. 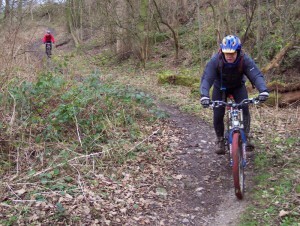 Turn left through the gate and follow the singletrack down through woods. The track soon descends steeply down some rooty and rocky switchbacks. At the bottom go across the bridge by the weir and continue straight on up the lane between the hedges. Continue all the way to the junction with the road at the top on the outskirts of Youlgreave (GR210646). Turn left and follow this road to the offset crossroads at the church in centre of the village. Go straight across and descend the lane to the right of the church. At the following forked junction turn left. At the next forked junction with a track on the left and a house ahead, where the lane turns right, take the track on the left. Descend the singletrack down the side of the house to a small stone bridge over the stream at the bottom (GR215641). 5. Cross the stream using the bridge, or the ford on the right, then turn left on the tarmac track along the bottom of the valley. A short distance later turn right and climb the track out of the valley. Continue straight ahead to a gate at the top, by a house on the right (GR222637). Just after the gate, where the track turns left, go into the field ahead and bear left to follow the line of the wall on the right. 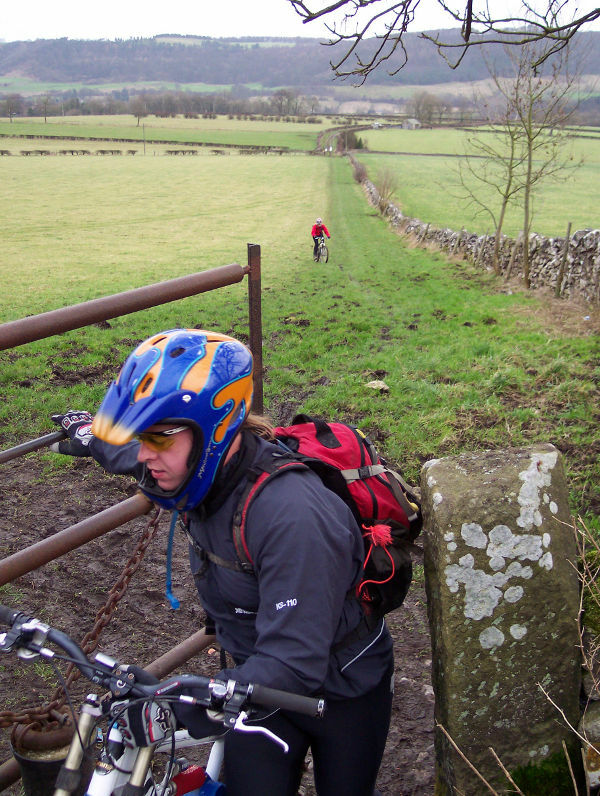 At the corner of the field follow the grassy singletrack between the fence and the wall to a gate. After the gate go straight on across the field, to a small gate on the other side. Go through the gate then cross the lane to the gate on the other side (GR226635). 6. Go though the gate and head straight on along the vague grassy track across the field, to a gate in the trees. 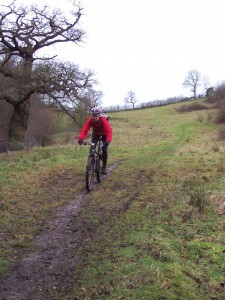 After the gate turn right and descend the muddy and rocky singletrack. The track soon opens out onto a grassy track that descends left to a very small gated stone bridge over a stream. Bear slightly right then climb in a straight line across the field to a small gate in the trees. Go through the gate then turn right and follow the B5056 to the next junction (GR231627). Turn left and climb to the road to Birchover. Climb into the village and go past the Red Lion pub, the public toilets and the bus stop. At a small triangular junction by the chapel turn right (GR239622). 7. Follow the lane out of the village. Go through a dip then climb to a junction with a track on the left near the top (GR240617). Turn left and follow the track through a number of bends and a farm. After undulating along the ridge for a while the wide track descends steeply though a few corners. 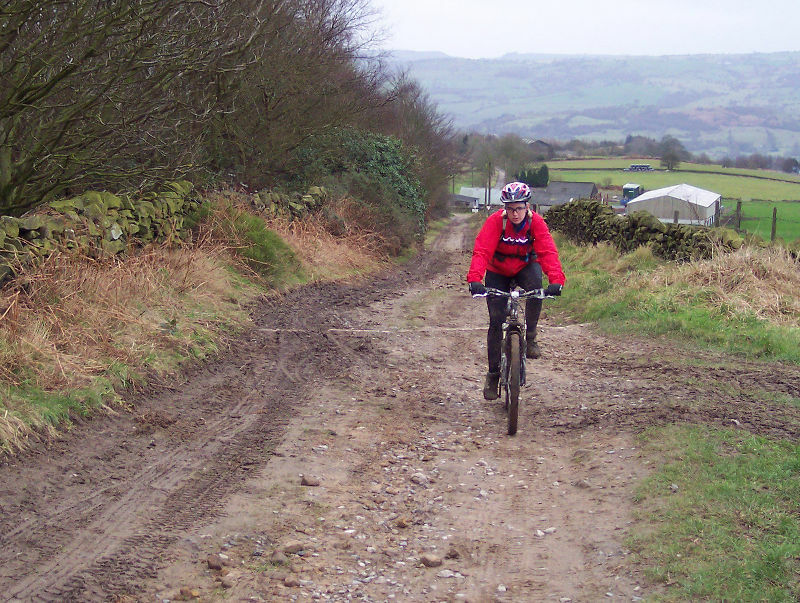 Stay on the main track for a steep rocky, muddy and rutted descent to a gravelly triangular junction at a lane (GR258619). Turn right then follow the lane, which then turns left and descends to a junction with a road. Turn right and descend to a junction in Darley Bridge (GR269620). 8. Turn left and follow the road left out of the village. After a long right hand bend go straight on at the following junction. Go straight over the 'Peak Rail' railway crossing then climb gently to a junction with the A6 (GR275628). Turn right, then at the traffic light junction immediately after turn left onto the B5057. Following the road out of Darley Dale and at the edge of the village climb through the steep hairpin bends. After the bends keep climbing the road to a track directly after the last house on the left (GR284632). 9. 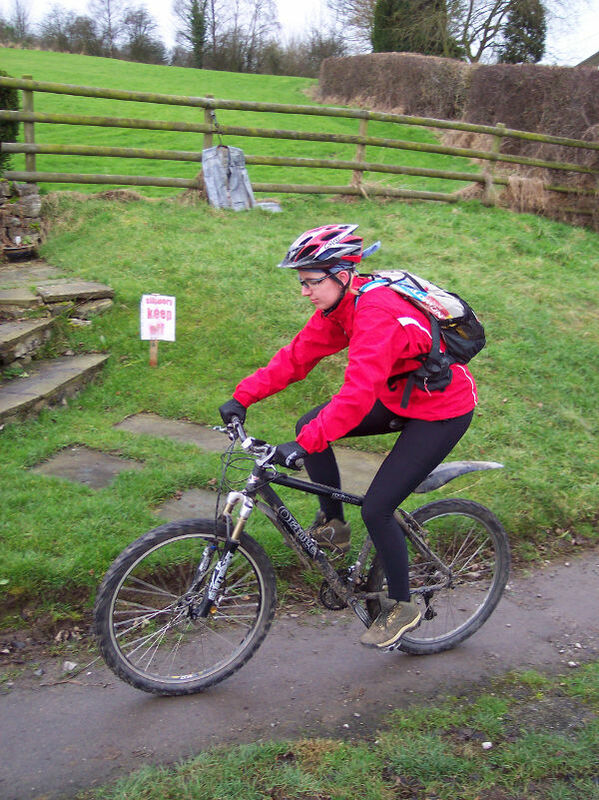 Turn sharp left up the track to the house then immediately turn right and climb the steep, loose and rocky track. This very tricky section of the climb eventually levels off and becomes double track, which eventually comes to a junction with a lane. Continue straight on and climb between the farm buildings to a junction just after (GR287640). Go straight on, keeping the trees on the right, and climb the wide rocky track. After a while bear right into the trees then left for the final steep kick to the climb. At the top continue straight on along the double track to a junction with a lane on the far side of the trees (GR292654). Go straight ahead and follow the lane to a crossroad junction. Go straight on and follow the rough broken road to the next crossroad junction (GR296673). Turn left and descend the road to a junction with a track on a sharp left hand bend at the top of the woods (GR287681). There is the good possibility of an ice cream here. 10. Turn right onto the wide dirt track on the outside of the bend. 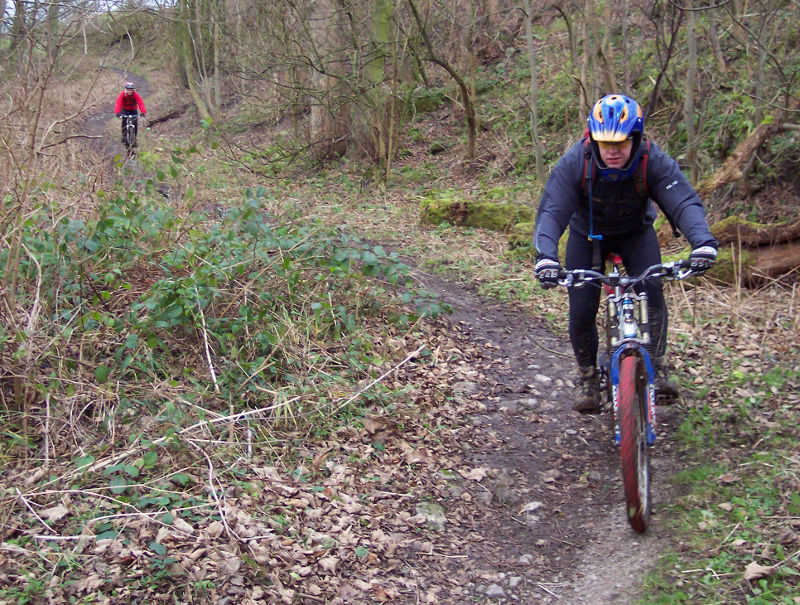 Follow the main track as it winds down Beeley hill. A tight but wide left hand bend leads onto a faster, rutted section of the descent, which straightens out before eventually coming to a lane at a farm. Continue straight on down the tarmac to a junction with a road at the bottom (GR262684). Turn right and follow the lane over the thin bridge with the traffic lights. Bear right on the road and climb to the next junction (GR258686). 11. Turn sharp left into the Calton Lees car park. Go straight through the car park then past the entrance to the garden centre on the left. Follow the lane as it bears right to junction (GR257682). Turn right then go straight ahead through a gate and climb the wide gravel track, keeping by the small stream on the left. Continue straight up the climb then go through a long steep ‘S’ bend to the houses. After the houses climb straight on through the trees, to a gated junction on the far side (GR244685). 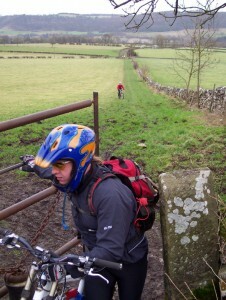 Go through the gate then turn right and follow the singletrack through the field, across the top of the hill. After the next gate bear left and descend through the trees to a gate on the far side (GR246689). 12. After the gate go straight down the stepped field to a marker post just before the next clump trees. Turn right directly at the post and follow the vague track along the grassy bench in the field to a junction with a number of tracks near the tree line. Turn square left and descend the very vague track across the field, in the direction of Chatsworth house, to the road (GR252693). Turn left and follow the road down through a right then left hand bend. Go past the entrance to Chatsworth House, on the right, to the next junction with the entrance to Edensor, on the left (GR251700). 13. Turn left and enter the village. At the forked junction take the right hand lane and climb past the right hand side of the chapel. Continue straight on up the lane, out of the village, to a junction at the end of the tarmac (GR246697). Go straight on to climb the wide dirt track into the trees. This track continues up through the trees for some way until it finishes at a lane (GR235697). Turn left and climb the steep lane to the top of the hill. After the top descend to a junction with some tracks on the left at the very top of Manners wood, next to a farm on the right (GR227694). 14. Take the second track on the left, a thin track that drops into the trees. This rooty woodland track soon bears left and encounters a very deep rut before reaching a crossroad in the trail (GR227692). Go straight across the junction and continue descending. The trail at this point can get a bit muddy, but in a fun slippery kind of way. Follow the trail ahead through a number of turns and down a section of rooty drops. The trail then crosses a golf course before dropping back into the trees. At the next small junction bear right down a short rocky track to a junction with a lane (GR223690). Turn left and cross the bridge to the next junction. Turn left again and descend the road through a long right hand bend to a junction at the bottom (GR220687). Take the first road on the left and return to the car park to complete the ride.